Over the years, some of my best 5-axis students have been the incredibly “green” machine operators, who couldn’t even spell CNC only a few months earlier. They had such little experience in the industry that they didn’t know they were supposed to be afraid of it – which allowed them to really excel at it. Surprisingly, the ones who seem to shy away from 5-axis are the experienced machinists…the very people who could really take this technology and turn it into an artwork of finesse and beauty! Let’s look at a typical 3-axis setup: a part is placed on the table in some sort of workholding device, and a specific location on the part is picked-up and used as the part zero reference point for the program. Once all of the features have been machined on that particular operation, the part is flipped to another face and the procedure begins again. This is repeated several times until the entire workpiece is complete, and all sides have been machined. Now, let’s look at the same scenario with the addition of a 5-axis machine: a part is placed on the table in some sort of workholding device, and a specific location on the part is picked-up and used at the zero reference point for the program…sound familiar???? The only real difference between the 5-axis setup, and the 3-axis setup, is the lack of manually having to flip the part and complete multiple setups. The machine is programmed to rotate the part into position, a command in the program is used to re-locate the origin point for the next side of the part, and the programming continues…just like in the traditional 3-axis method. After analyzing this conundrum for a while, I finally realized that it isn’t the actual concept of five axis or five sided machining technology that scares them…because that is a very simple concept to grasp. It seems to be the “how” that scares them. People understand the single setup vs. multiple setups, the removal of manually flipping the part, and the concept of relocating the origin point for a specific side of the part. What they don’t understand is how we are going to do all of that…because, in their minds, it must be difficult…right? WRONG! It is really quite simple. Although most machine tool builders handle these events, or steps in the process in a very similar fashion, I will focus on how Hurco accomplishes the task. 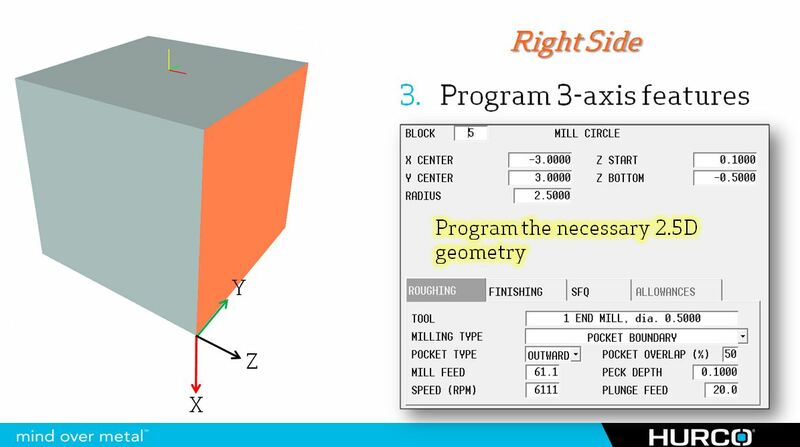 Whether you are programming a part in NC or Conversationally the concept and procedure for programming on multiple sides of the part are the same…we are going to designate a relative origin point for the new side of the workpiece, create a rotated or transformed workplane that the tool axis will be perpendicular to, and then continue programming simple 3 axis geometry to complete the necessary machining for that side of the workpiece. Once the features have been machined, we will simply end this new transformed workplane – causing everything to revert to the original part setup – and then we will repeat these steps, over and over again, until all sides of the workpiece have been machined. First, we need to move the origin point. 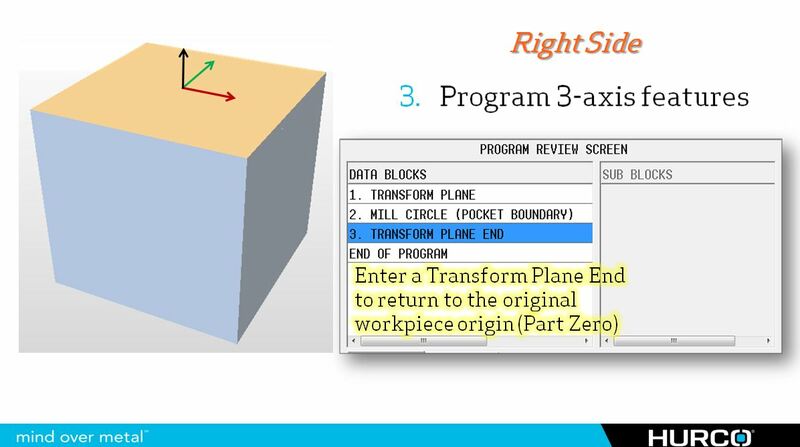 Using a conversational block, called Transform Plane, we will provide the control a roadmap of directions from the original workpiece zero, to the newly desired origin point for the new workplane. 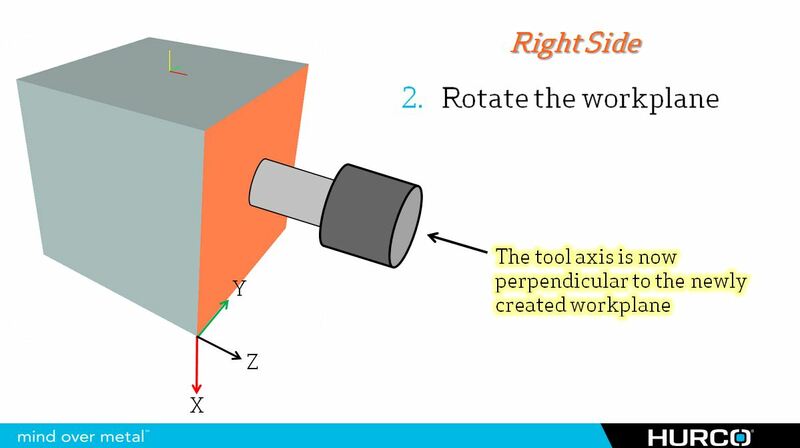 Next, we need to tilt the workplane to create a tool axis that is perpendicular to the desired face of the part. When programming this step, we will simply program the tool moving around the part, and we don’t care what the actual machine configuration is. In this example we will rotate 90 degrees around the Y-axis (B-axis move)…even though the machine may not have a B-axis, the control will figure out how to position the axes it has available, to achieve the tool orientation we have programmed. 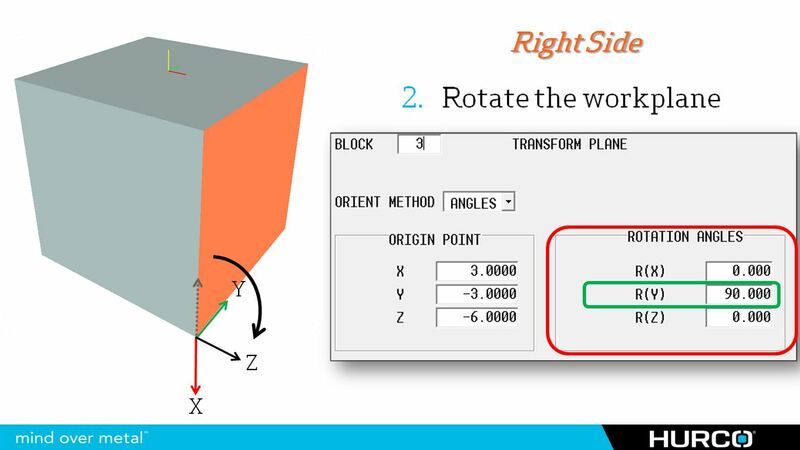 With the origin point successfully relocated, and the workplane tilted into position, we can now program our simple 2.5D or 3D features as directed by the part print. 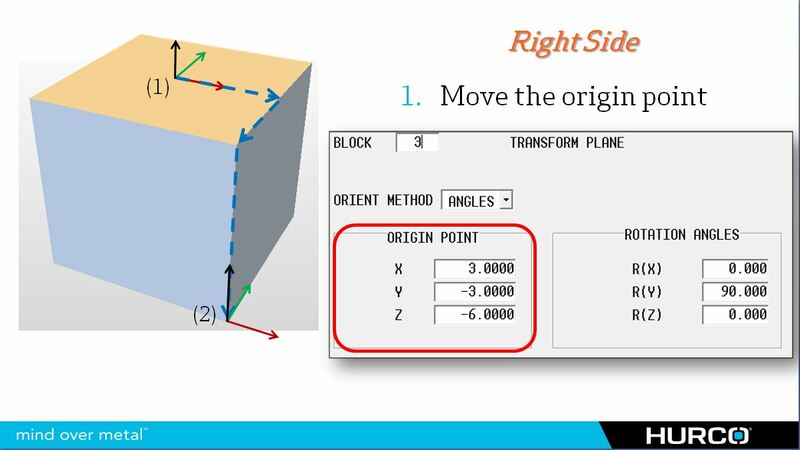 Finally we need to cancel the current “Transform Plane” to revert everything back to the original part setup location. We will now repeat these steps until all sides of the part have been successfully programmed. As I mentioned above, the procedure is basically the same regardless of whether we are programming in Conversational or NC. To program the same tool orientation in the conversational example above, we would simply use a G68.2 command to move the origin point and orient the tool, then a G69 to cancel the NC Transform Plane. The code would be similar to this: G68.2 X3.0 Y-3.0 Z-6.0 A0 B90. Hopefully this helps to remove some of the scary mystery surrounding the horror that is 5-axis programming. Once you have been to OZ, and seen behind the curtain, you realize that it is all just fun and games!